Going low carb? Keep these minerals in mind. Home > Articles > Magnesium Research > Going low carb? Keep these minerals in mind. While salt (sodium), magnesium and potassium are an important part of everyone’s diet, they become even more crucial when you move away from the standard western diet and transition to a low-carbohydrate way of eating. When you cut your carbs dramatically and switch your main fuel source to healthy fats, the transition can give your body a bit of a rough time as it adjusts to its new fuel source. This can manifest as ‘low carb’ or ‘keto flu’ with symptoms such as exhaustion, dizziness, nausea, headaches, cramping, irritability and poor concentration. To make the transition as smooth as possible, it’s important to ensure that you are getting adequate salt, magnesium and potassium in your diet. Eliminating processed foods will almost completely remove added sodium from your diet. Around 75% of salt in a western diet comes from processed foods, rather than salt added during cooking or at the table. In addition, if you increase your exercise at the same time, you will also lose sodium via sweat. While most people on a standard diet probably consume too much sodium; it’s most definitely not a case of the lower the sodium intake the better because sodium is essential for life. It plays a key role in cell hydration, fluid balance, potassium uptake and digestion. While transitioning to a low-carb way of living you will need to increase your salt intake, particularly if you have symptoms of low sodium such as dizziness, headache and fatigue, especially while exercising. It’s great to drink salted bone broth regularly (or bouillon in a pinch) and to use salted butter. You should also add moderate amounts of salt to taste while you are cooking or at the table. Many people these days favour ‘Himalayan’ pink salt over processed table salts, but this salt is actually mined in Pakistan (over 300km from the Himalayas) using conventional mining techniques. It then is flown over 11,000km to Australia generating unnecessary carbon emissions. While it looks pretty, there really is no advantage of ‘Himalayan’ salt over high-quality Australian salts. Ancient Lakes Magnesium is a small family business that produces truly sustainable ancient lake salt from Lake Deborah in Western Australia. Lake Deborah was formed millions of years ago, and is a pristine deposit of ancient sea minerals. The minerals are harvested seasonally and are solar concentrated, making them very low in carbon emissions. Ancient Lakes Magnesium Mineral Balance salt is pure, natural Australian lake salt enhanced with ionic magnesium bitterns. Returning the solar concentrated bitterns to the salt boosts its magnesium content to 4.4mg/gm. Ancient Lakes Magnesium’s solar evaporated salt flakes are hand harvested and naturally rich in magnesium – containing 8mg/g. They are a great accompaniment to any dish, or you can add a few flakes to a glass of water if you are very low in sodium. Like sodium, potassium is stripped from your body when it drops that retained water. It’s crucial to ensure that you are getting enough potassium in your diet, especially as it needs to be in balance with your sodium consumption. Having said that, there can be health risks associated with self-prescribing potassium supplements. If you would like to take potassium supplements it’s best to check with your doctor first. The best way to ensure you are getting enough potassium is in your food. Several types of meat are excellent sources including bacon, beef, pork and salmon (make sure you also eat the cooking juices as they will contain a lot of the potassium). Low-carb vegetable sources include the amazing avocado, spinach, silverbeet (chard); and fungi such as mushrooms. Magnesium is essential for life. It is found in every one of your cells and is a critical co-factor in more than 300 enzymatic reactions in the human body. Magnesium is the fourth most prevalent mineral in your body and is necessary to maintain normal nerve and muscle function, electrolyte balance, protein synthesis, cell division and teeth and bone structure among many other things. Magnesium also plays a role in regulating the balance of potassium, sodium and other electrolytes in your body, so can be helpful in ensuring that your cells are absorbing enough potassium from the foods you eat. Unlike sodium and potassium, magnesium isn’t stripped from your body when you transition to a low carb diet. However, 50–70% of people do not consume enough magnesium in their diets and their intake could be considered chronically low. This is due to a range of factors including poor diet, processing of foods, intensive agriculture and degraded soils. In addition, the water we now drink is highly processed and depleted of minerals. In the past, people drank water from natural sources such as streams and wells. This water contained many dissolved minerals. This is called ‘hard’ water and it tends to cause deposits on pipes and clog them up, so water today is treated to remove the minerals and make it ‘soft’. Removing all these minerals has had a significant impact on our mineral intake. It’s so important to remineralise your drinking water with a natural source of magnesium and other minerals. This is one of the most significant things you can do to ensure your diet contains enough magnesium to keep your levels optimal. Adding magnesium can also assist with the constipation that can plague low-carbers. Concentrated Ionic Magnesium bitterns from Ancient Lakes Magnesium are a rich source of 100% natural magnesium, and also contain potassium, sodium and iodine. They are harvested seasonally from pristine Lake Deborah, and are certified organic. 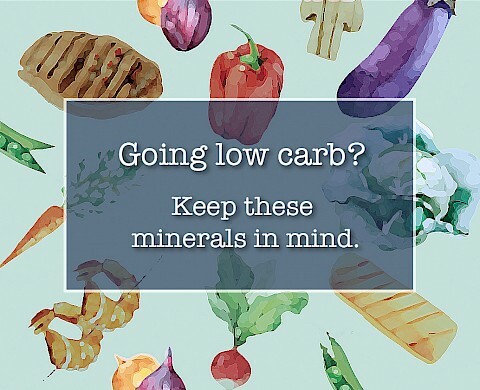 So as you make the switch to your new low carb lifestyle, please keep in mind your increased need for these three essential minerals. Increasing your sodium and magnesium intake, and ensuring that you are getting adequate potassium should help you to reduce the symptoms associated with your low carb transition, and will get you well on your way to a new, healthier way of eating.